Day 5: 25 Days of Christmas Ideas. Making a Christmas tree for the birds is a great way to teach kids generosity. Thinking of others is a first step in having a generous heart. Taking the time to take care of one of God’s creations is another step toward having a generous heart. Choose a tree with low branches. An evergreen tree works great for this project. Gather the supplies (listed below) and create ornaments and garland out of items that will attract birds. Make sure to position them so birds will be able to land on a branch and reach them with their beaks. String cranberries or popcorn using the needle and string. Make long strands to loop around the tree. 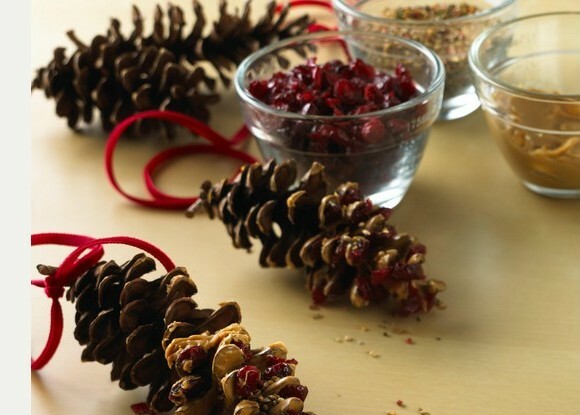 Cover pine cones in peanut butter and place in a lunch bag with seed. Shake to cover with seed. Tie a string on the top of the pine cone and hang from the tree. Cut pieces of bread in Christmas shapes using the cookie cutters. Spread peanut butter on them and coat with bird seed. Make a hole in the bread and tie a ribbon in a loop through it. Hang the loop on a branch of the tree.